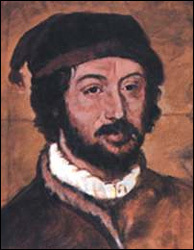 Juan de la Cosa (c. 1460- February 28, 1510), Spanish cartographer, conquistador and explorer. Cosa was member of seven voyages to the New World. According to tradition he was born in 1460 at Sta. Maria del Puerto (Santoña), on the Bay of Biscay, Spain. He passed his life from earliest childhood on the ocean. From the waters of his native country, which he knew thoroughly, he soon ventured onto the coast of Western Africa, which was at that time the goal of so many Spanish expeditions. Cosa sailed with Christopher Columbus on his first three voyages to the New World. On first voyage 1492 Cosa was the owner of ship Santa Maria. On Columbus second voyage 1493 Cosa was the master and cartographer of the Marigalante. On Columbus' third voyage 1498 Cosa was on the ship La Nina. On fourth voyage 1499 Cosa was the first pilot for the expedition of Alonso de Ojeda and Amerigo Vespucci, and was with them amongst the first to set foot on the South American Continent on the Gulf of Paria. At the same time the coast from Essequibo River to the Cape Vela was explored. In fifth voyage 1500, Cosa explored, with Rodrigo de Bastidas and Vasco Núñez de Balboa, present day Colombia and Panama. He continued his discoveries along the South American coast to the isthmus of Panama, and returned in 1502 to Haiti. When the Spanish court found soon afterwards that the Portuguese had made several incursions into the newly discovered country, Queen Isabella sent Juan de la Cosa at the head of a delegation to Portugal, to demonstrate. Cosa was nominated alguazil major, and in 1504-05(?) (or 1506) was commander of an expedition to the Pearl Islands and the Gulf of Uraba to found settlements there. At the same time he visited Jamaica and Haiti. In 1509 for the seventh and last time Juan de la Cosa started for the New World. He carried two hundred colonists on three ships and on reaching Haiti he placed himself under the command of Alonso de Ojeda, who added another ship with one hundred settlers to the expedition. After having decided an old frontier-dispute between Alonso de Ojeda and Diego de Nicuesa, they went with Pizarro into Ojeda's territory and landed at Cartagena against the warnings of Cosa, who proposed to disembark on the more peaceful coast of the Gulf of Uraba. They were attacked by the natives and Cosa was shot with poison arrows and was killed by Indians. Juan de la Cosa made several charts of which one, Mappa Mundi (1500), the famous chart of the world is still preserved. It is the oldest representation of the New World. Of special interest is the outline of Cuba, which Christopher Columbus never believed to be an island. Walkenaer and Alexander von Humboldt were the first to point out the great importance of this chart. It is now in the Museo Naval in Madrid. Reproductions of it are given by Humboldt in his Atlas géographique et physique.